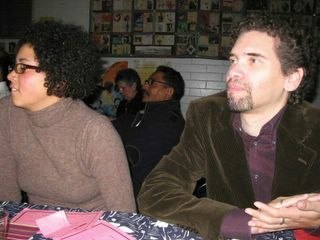 For the second time, the Hogan's Alley Memorial Project was in attendance at the annual Black History Month Celebration Luncheon at the Hastings Community Centre, where many of Vancouver's black families and other members of Vancouver's various black communities come together to see old friends, feast, and to enjoy a variety show. It was an opportunity for HAMP to connect with some long-standing members of Vancouver's black communities and to raise awareness about our oral history project. We are currently working on a book of oral histories about Hogan's Alley, a neighbourhood in East Vancouver that was once the centre of a black community, but which was destroyed in the late 1960s to make way for a highway (the Georgia Street viaduct). Photo highlights of the show soon to come. The Hogan's Alley Memorial Project is a grassroots cultural organization which formed in 2002; we are dedicated to keeping the black history of Vancouver alive and part of the present.